The daily grind… You know the one. The Monday through Friday workweek circus, where an overflowing inbox mingles with overcommitted iCal meetings and perhaps even one-too-many happy hour obligations. With the often jam-packed agendas of today’s world, it may be easy to overlook some of the smaller details, such as caring for those fundamental (and fashionable!) accessories that carry you from one appointment to the next. But don’t let your shoes suffer as a result of your schedule! Daily shoe care is far less time-consuming than it may sound and it delivers plenty of bang for your time buck. Daily care can go a long way towards keeping a great pair of kicks looking incredible—almost as if they had just emerged fresh from the shoebox—for years to come. 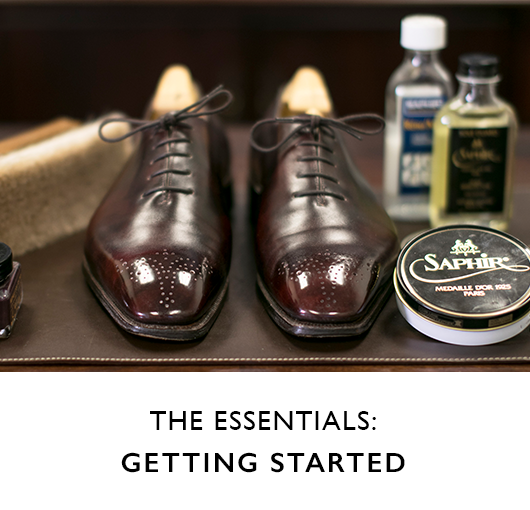 The process can be broken into two basic categories: morning shoe care and evening shoe care. 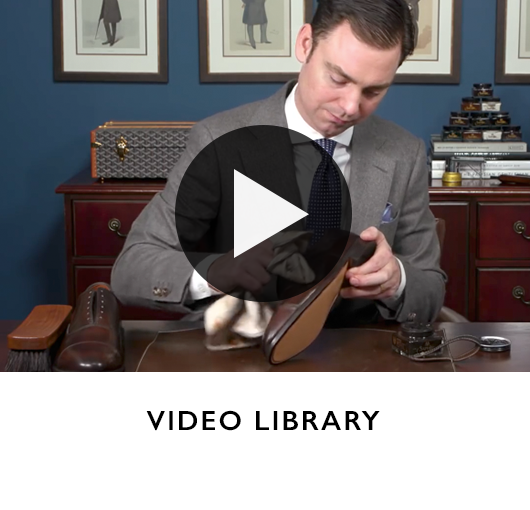 And, it’s really as simple as A… B… C.
A shoehorn is a simple tool that allows a gentleman to easily put on his shoes without damaging the heel counter. Yes, it may seem a bit inconvenient at first. But, outfit every corner of your life—from briefcase to office, closet to study, and even that downstairs couch—with this tool and its use will soon be second nature. Your shoes will thank you. In fact, there is never really a case where a shoehorn should not be used (with the singular exception of boots, which do not generally require one). If you do happen to find yourself without a shoehorn, or perhaps you forgot to pack one in your suitcase, a drivers license, room key, credit card, or even folded paper can be used in lieu. 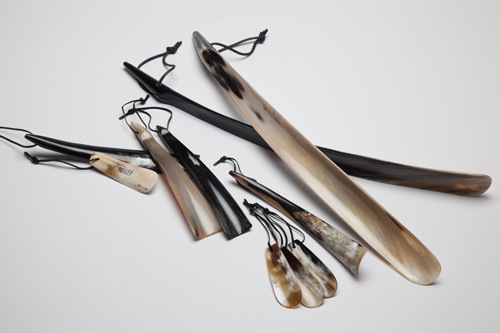 As advocates for always having a shoehorn around, it is not surprising that we here at the Hanger Project carry one of the widest selections of shoehorns on the internet. Click here to view our assortment. 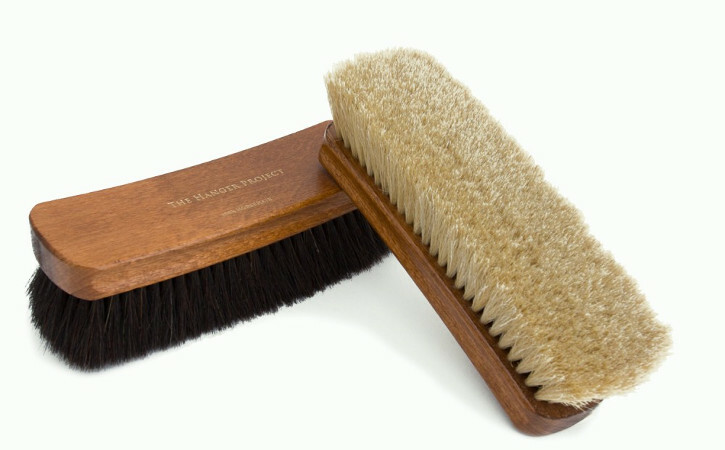 A horsehair brush can be used to remove any dust that may have settled since you last wore your shoes. All that is required is a very gentle, brief brushing. To restore a soft shine to your shoes, use a cotton chamois (or cotton shoe bag, if a chamois is not handy) to buff that desirable sheen back into the leather. 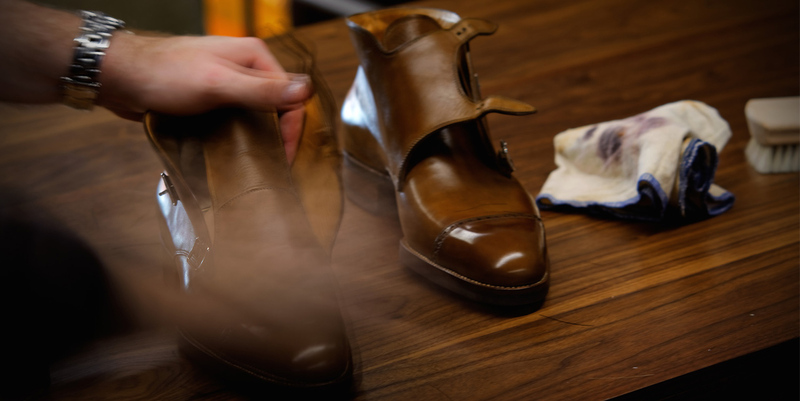 If shoes have been properly maintained, residual waxes should remain in the pores of the leather uppers. A gentle buffing softens and smoothes these waxes, thereby restoring a nice, soft patina. Shine on! 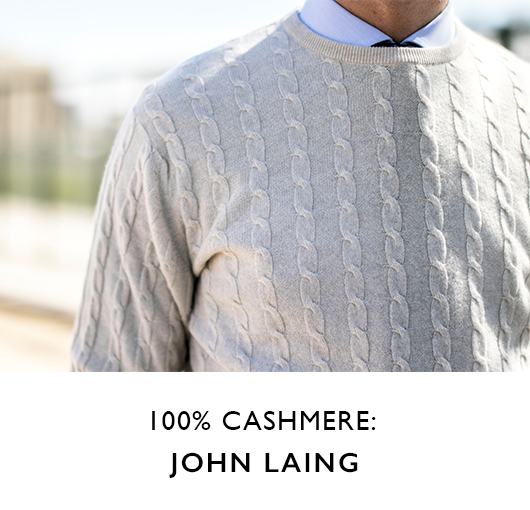 Alternatively, our Lambswool Shoeshine Mitt from La Cordonnerie Anglaise is very effective. 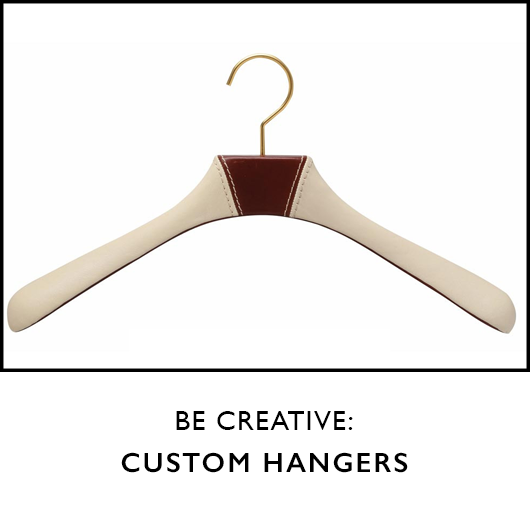 Pulling out a pair of long-forgotten kicks, or perhaps switching out your shoe closet for the season? A fourth step may be required in your morning shoe care routine. If it has been a while since your shoes have been shined or worn (or if you have any difficulty restoring a soft patina with the prior step), you may want to apply a touch of Saphir Médaille d’Or Renovateur with a corner of the cotton chamois. Allow the product to dry for 30 seconds, and then buff it off. The cotton chamois should easily work a nice matte patina with Saphir Renovateur alone. The Renovatuer will also restore the moisture and nourishment required to prevent any cracking—this is particularly necessary if a pair of shoes have been sitting dormant for a while. 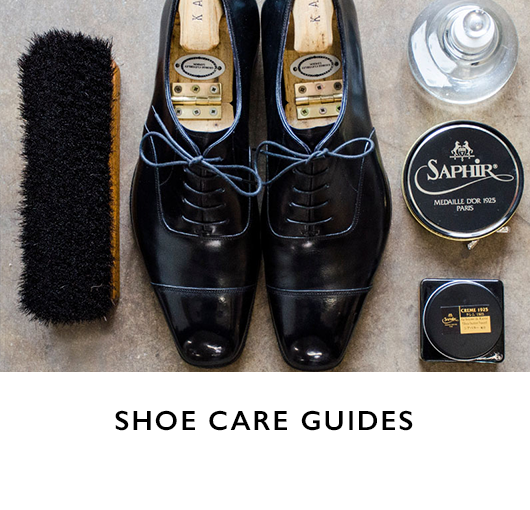 With just a few short steps of proper A.M. care, your shoes will shine brightly and will look like they have been recently and professionally polished. 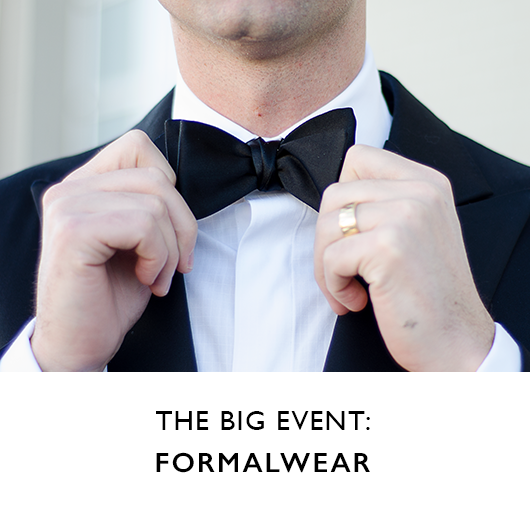 Only you know the secret to the short few seconds behind the sheen. 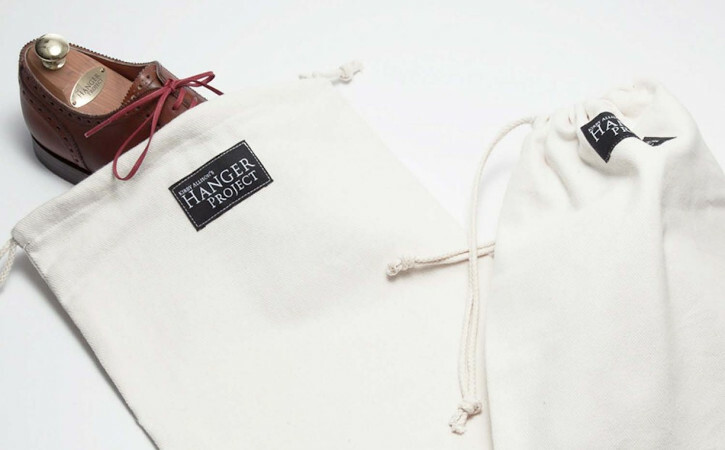 After a day of exposure to the elements—from inclement weather to dirt and dust—your shoes have been through the ringer, so to speak. To ensure they emerge as unscathed as possible, a few quick but crucial tasks should be performed in the evening. A nightly shoe care routine is essential to complete before putting that pair away until another day. And like the morning routine, the P.M. one also has its own set of ABCs. If you have the luxury of time, give your shoes a breather, too, and allow them to air out for 15 minutes after removing them. 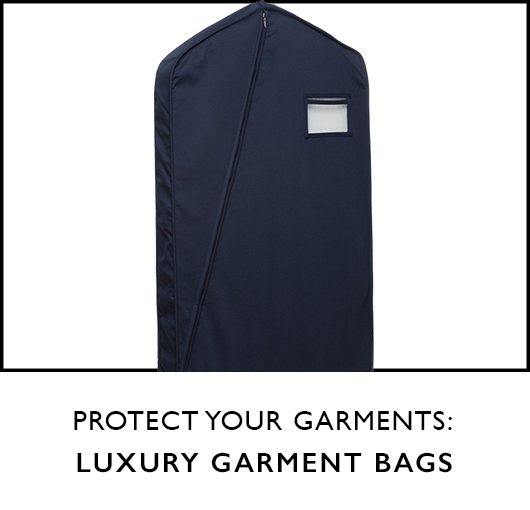 During the day, the inner lining and insole absorb a significant amount of foot perspiration. By allowing shoes to breathe after they are removed, the majority of this moisture can evaporate before shoetrees are inserted. A shoetree is a device that mimics the contour of a foot and helps restore and preserve the shape of a pair of shoes when they are not in use. 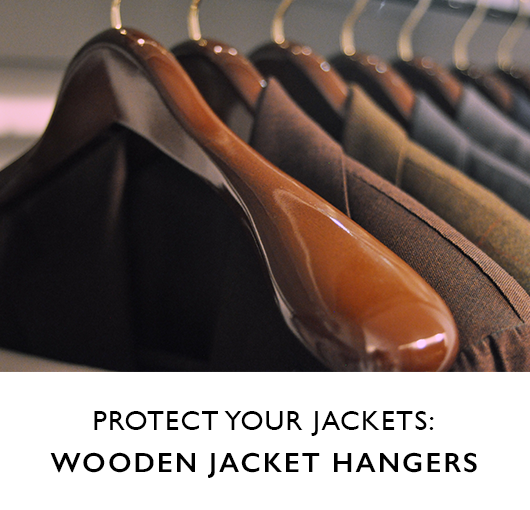 It also smoothes the wrinkling of leather that can occur as a result of wear. Shoetrees made of cedar, as opposed to plastic or metal, are ideal, generally fine and have the benefit of both eliminating odor and wicking away any residual moisture left in the shoes at the end of the day. 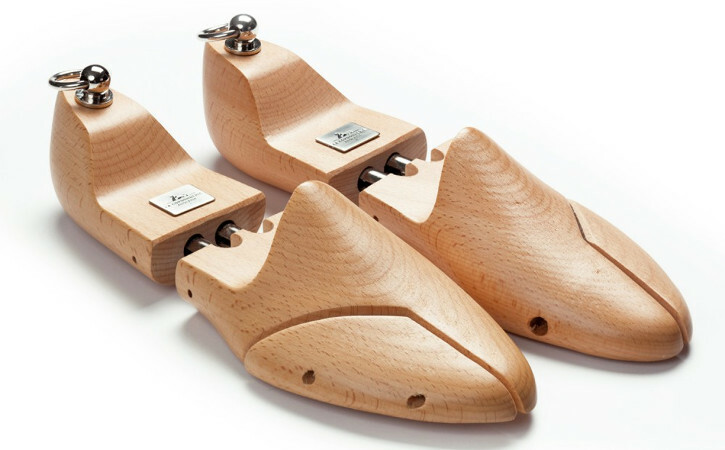 That being said, while cedar shoetrees are fairly easy to find and fairly inexpensive, most luxury shoetrees, such as the Perfecta model from La Cordonnerie Anglaise, are actually made from the same sort of high-quality beechwook that makers of fine bespoke shoes use for their lasts. carved from high-quality beech wood. Every pair of shoes should be stored with shoetrees. If you do not have shoetrees for every pair, then use them on the shoes most recently worn. 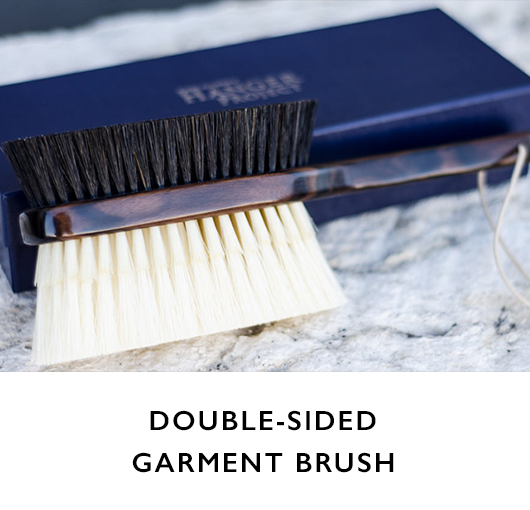 As in the morning routine, a second gentle brushing with a horsehair brush will act to remove any dirt or smudge that has accumulated throughout the day. 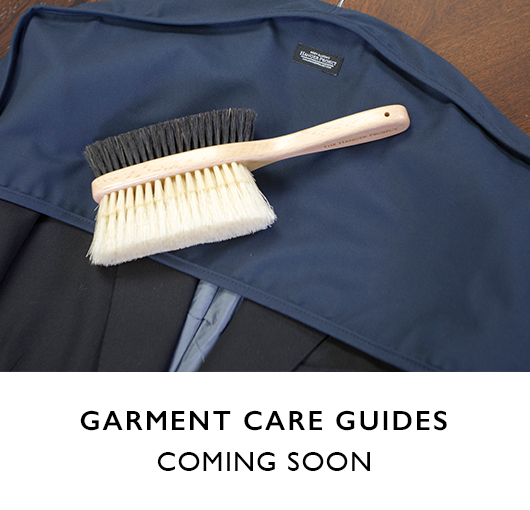 If any hard soiling has occurred and is not removable via brushing, spot-clean using a damp cloth. And, it's as easy as that. Two sets of ABCs for morning and night, plus two to three minutes, is all you need to ensure that those kicks stay in superlative shape. 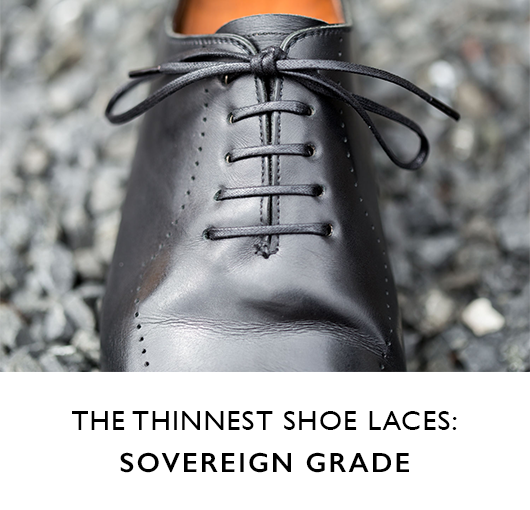 A little maintenance will go a long way to keeping your shoes healthy, handsome and in top condition for years to come.